2013 Triumph Trophy first photos, information and specifications! Triumph Tiger Explorer first photos and video from the 2011 EICMA show! Triumph Tiger 800 info, photos and video. Booster Plug fixes fuel injection problems on the Triumph 1050 engine. Triumph Street Triple R Review! Triumph and TAG Heuer team up on Special Edition Bonneville! 2009 Triumph Daytona 675 has more power and better handling | Triumph announces the Street Triple R | 2009 Triumph Motorcycles and the 2010 Triumph Thunderbird | 50th Anniversary Edition Bonneville by Belstaff and Triumph | Triumph Rocket III Turbo! | 2008 Triumph Triple Challenge race series information | Two-part wBW series covering the ignition coil replacement on a Thunderbird Sport and Triumph Trophy; see Part 1 and Part II | Triumph Street Triple released! wBW Triumph Tiger page with information, maintenance and repair articles and more! BonnevilleAmerica.com has lots of information and discussion forums for owners of Triumph Bonneville America, Triumph American and the Triumph Speedmaster | TriumphRAT is probably the largest Triumph motorcycle owners information resource and discussion group in the U.S.A.
See the wBW Triumph Thruxton page for more info! | NewSpeedmaster has Triumph Bonnevile, Speedmaster, Speed Triple and Thruxton parts; check out their Thruxton CNC billet sprocket cover | Nice-looking Thruxton adjustable handlebars, silencers and more at Thunderbike in New Zealand (they ship worldwide and the exchange rates aren’t bad!) | Official Triumph Thruxton parts and accessories and parts for all Triumphs at AZSBK in Arizona, U.S.A.
Tiger accessories, including a touring seat and a muffler that’s claimed to add 19 hp atThunderbike in New Zealand (see the dyno charts also!) | Check out this great selection of photos of a Mike’s 2005 Triumph Tiger, from the showroom to a club ride! Swingarm – Paddock Stands: If you don’t have a centerstand on your Triumph, you need one of these! Check out the wBW Review of the Steel Horse Swingarm Stand; it fits the Thunderbird Sport! Parts – Accessories for Hinckley Triumphs: How about a belt drive conversion kit for the Triumph Bonneville? Possible fitments also for other Triumphs at Quiet Power Drive | Sprint Manufacturing (U.K.) carries many different parts for a variety of Triumphs, including fairings, exhausts, headlights, carbon fiber and more | Baxter Cycle is a dealer for Hinckley Triumphs and also carries many parts | New and second-hand parts for Triumphs at Triumph’ant (U.K.) | Carbon fiber engine covers and other parts for Triumphs seem hard to come by – if you know of any sources, please drop us a line (see Site Info page)! Visit the wBW Motorcycle Maintenance and Technical Articles page for a huge list of many maintenance and tech articles and more! Motorcycle Wheels: See the wBW Motorcycle Wheels Page for information on motorcycle wheels for both vintage and modern motorcycles | Akront wheels now being manufactured again! 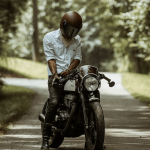 Triumph Repair and Maintenance: All Triumph articles now listed on the wBW Motorcycle Repair Index | Frappr list of Triumph dealers in the U.S.A.